Inspired by winter night and twilight forest theme. Monochrome Black and White original painting on pure silk. 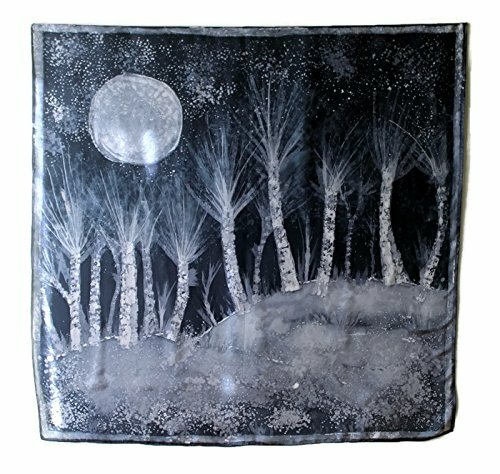 Every item is different because of freehand painting made by me according to my mood - not knowing where I'll end up :) The brilliant and gorgeous idea for a gift - could be used as wall art or big unique artistic scarf. Painted on delicate and a little bit shimmering lightweight 100% natural silk Habotai 8 mm. It is easy to put silk on two sticks and hang on the wall or stretch on a canvas frame. If you have any questions about this product by SilkForPassion, contact us by completing and submitting the form below. If you are looking for a specif part number, please include it with your message.